Owning a boat can be expensive and then having to think about an additional fish finder can definitely send your budget crashing down. As an avid angler, you will be tempted to buy a high-end fish finder, but if that is not in the cards, a more affordable option is what you need to be looking for to enjoy your fishing experience. 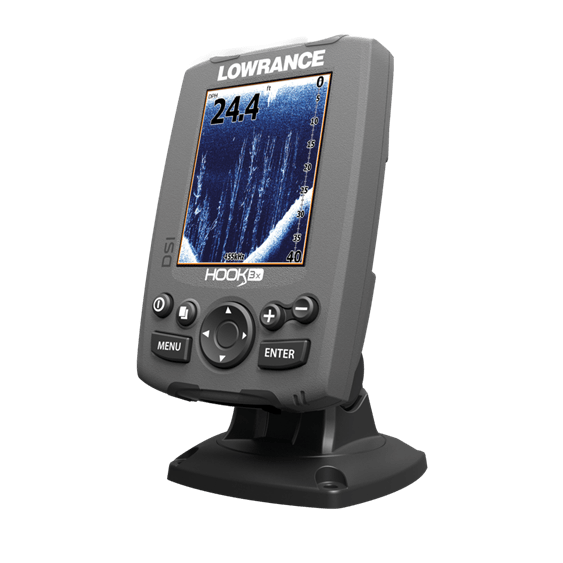 The Lowrance HOOK-3x is an affordable fish finder, eliminating the need to spend hundreds of dollars on something that you really need to make the best out of your fishing experience. It is simple and easy to use and includes sonar signals that will detect fish around and underneath the boat. If you are just starting out your career or hobby as an angler, the fish finder is a great way to detect fish and differentiate between debris commonly found in lakes. Fishing Tech gives the Lowrance HOOK-3x Fish Finder an overall rating of B. The Lowrance HOOK-3x features a 3.5-inch LED-backlit display, large enough to see out of the corner of your eye and the LED backlight will counter any sun that might be shining on it. It also makes the fish finder ideal for use at night and the waterproof cover offers great protection from the weather and sudden rainstorms. Additionally, the Broadband Sounder Technology details everything clearly at the bottom of the lake, clearly painting a picture of the bottom contour and the structure detail underneath. In many of the older fish finders, you still need to constantly adjust the settings manually to see the fish and the bottom structure clearly. The Advanced Signal Processing eliminates the need to do this and it will automatically adjust to the right settings to provide a clear picture. The sonar is one of the most important aspects of a fish finder and the Lowrance HOOK-3x operates on 83kHZ to provide a conical view of around 60 degrees. However, if only a smaller area is needed, the 200 kHz option provides a smaller 20-degree conical coverage, making it perfect for drop shotting. The Lowrance HOOK-3x features a Patented Skimmer transducer that includes a water temperature sensor and it can track up to 75 MPH. The Sonar on the slightly more expensive DSI is a 455/800 kHz for closer and more accurate views of the bottom and the fish around the boat. Instructions are provided for mounting and it also comes with a bracket that can be used to adjust it. This means that tilting and moving it is simple and it can be removed for security reasons when not in use. Additionally, the fish finder can be placed on any other fishing boats or kayaks you have and with this bracket, the swapping will be instant. This versatility, along with the small size, makes it a perfect option for kayakers as well. It comes preloaded with 11 different languages, making it possible to use it in any country you live. Setting it up is the toughest part of the Lowrance HOOK-3x fish finder and the rest is easy to use and navigate to. All of the features are constantly in use and if you are looking to change the settings, this can be done without really taking up too much time. The backlight can be turned off and on at the touch of a button depending on the conditions you are facing. One of the downsides is the setup instructions and after wrestling with it for a little while, you will be able to set it up. The instructions could have been a little better designed to make them easier to understand. It might be small, but it is extremely versatile to any avid angler catching from multiple different boats or kayaks. Not only can it be interchanged between vessels, but also it is great to use during any type of weather. The display is rather small, but still decent and with the backlight activated, lowlight conditions should not hinder your view on the fish finder. While this might not make much sense to the beginner, but avid anglers will know that different types of fish tend to be active at different times of the day and without a backlight feature, they can be easy to miss and leave you empty-handed. While small and compact, the Lowrance HOOK-3x is the perfect fish finder for beginners or occasional anglers. The lack of a GPS is quite concerning and it is something that helps when it comes to saving hotspots and tracking specific locations. Additionally, the lack of Wi-Fi or internet use means that there is no ability to upload any maps or special locations and you are quite limited to the area that you are fishing in. However, it is durable and has a waterproof rating of IPX7, which means that it is able to resist water for up to 30 minutes at a pressure level of 1 meter deep. This feature makes it perfect for catching fish on bad weather days. Once it has been mounted and you are ready to go, the performance is reasonably good. It has a maximum power output of 180 Watts and features a display resolution of 320 x 240 throughout the period it is used. The conical specifications also turn out to be quite accurate and with the fish icons, it can be hard for a child to miss the fish when they appear. Astoundingly, the depth is quite reasonable for lakes, but this fish finder will not be the best option if you love angling in the ocean or near salty waters. It works perfectly in local lakes and for basic fishing purposes. The backlight can be controlled with a touch of a button once you need it. The Lowrance HOOK-3x fish finder is one of the entry-level Lowrance fish finders and it forms the basis for all the other HOOK models. Lowrance went for affordability and simplicity with this version and it’s clearly a top option for beginners. As one of the most affordable fishfinders, it does not have much in terms of competition when looking at the price. However, the Garmin 010-01550-00 Striker 4 Bbuilt-in GPS Fish Finder closely matches the price of the Lowrance HOOK-3x DSI and with the addition of a GPS, it might even be wise to spend the extra couple of bucks. The Garmin STRIKER 4 features the same sized display as the HOOK-3x models and it is a little easier to mount as well. The addition of a GPS allows users to mark hotspots and return at a later stage, while also keeping the user from ever getting lost. The CHIRP sonar technology is state of the art and it includes a dual frequency that can be toggled between with a touch of a button. See our Garmin STRIKER 4 review. The Raymarine Dragonfly-4DV Sonar fish finder is slightly more expensive and features 4.3-inch display system. With CHIRP DownVision technology incorporated for the sonar, it is a little more accurate and the mounting is much easier. It is a little more expensive than the DSI versions but packs a few more features that might make it more versatile and useful. See our Raymarine Dragonfly 4 review. While fishing itself is rather expensive, the Lowrance HOOK-3x and the subsequent packages make it a little more affordable to get in the water. The mounting is somewhat of a pain, but once this is over and done, the versatility is and ease of use is really great for any angler. The only improvement we would have liked to see is the addition of a GPS for mapping and setting waypoints. It would have also been great for planning if you had maps to read through before actually setting out on your journey.